Kelowna businessman and community volunteer Brad Bennett will receive an honorary doctoral degree at this June’s Convocation ceremonies at UBC’s Okanagan campus. Brad Bennett has a long and distinguished record of community service in the Okanagan and leadership in higher education in British Columbia. 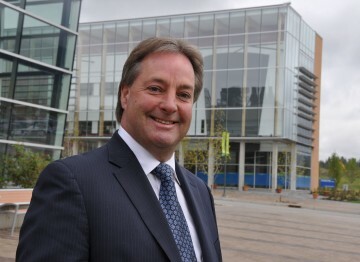 He served as Chair of UBC’s Board of Governors for five years, and was instrumental in the creation of UBC’s Okanagan campus. Since 1990, Bennett has been the president of McIntosh Properties Ltd., a real estate investment and holding company. He is a director of the Premier’s Technology Council, UBC Properties Trust Board, a trustee and member of the Executive Advisory Board of the Fraser Institute, and a member of the BC Business Laureates Hall of Fame Cabinet. Bennett has also served as Chair of the Kelowna General Hospital Foundation, the Okanagan University College board, and was the first co-chair of the Okanagan Partnership, a community-led, non-profit society dedicated to the vision of a prosperous and sustainable Okanagan region. He is a recipient of the Queen Elizabeth II Golden Jubilee Medal, and the Honorary Alumni Award from UBC. In October 2010, Bennett was awarded the Order of British Columbia. *This citation was originally released on May 2, 2012 and can be found on UBC’s Okanagan News website. Brad Bennett addresses graduates, officials and members of the audience after he received an honorary Doctor of Laws degree at the University of British Columbia Okanagan Campus convocation ceremony Thursday. Brad Bennett’s passion for his province and his university drove him to achieve success as a business leader and community builder. 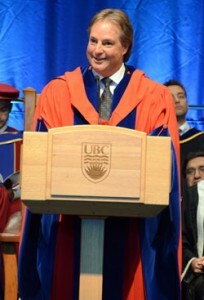 Upon being conferred with an honorary doctor of laws degree at the University of British Columbia’s Okanagan campus Convocation ceremonies, Bennett said he accepts the recognition with a profound sense of humility. Bennett told graduates his first rule in life is to do the right thing, because it always results in a positive outcome. Secondly, he advised students to be risk takers. “Understand that most people fail in life because they are afraid to take a risk.” He said, recounting former UBC President Martha Piper telling him about taking on the job to head the university, despite not knowing what the future held in store. UBC President Stephen Toope called Bennett a visionary leader with a deep commitment to his community and province. Bennett served as Chair of UBC’s Board of Governors during some of the most turbulent economic times as well as during an exciting period of growth and opportunity for the university. *This partial citation was originally released on June 10, 2011. To read the full citation, please visit UBC’s Okanagan News website.